In Hellenistic and Roman times, Aphrodite’s identity was often fused with those of Egyptian fertility goddesses: Isis, Hathor and Bubastis. This figurine represents Isis-Aphrodite anasyromene or Isis-Bubastis. The figure lifts her short-sleeved tunic to reveal her pubic area and wears an elaborate kalathos-shaped headdress, reminiscent of those worn by Cypriot Aphrodite. 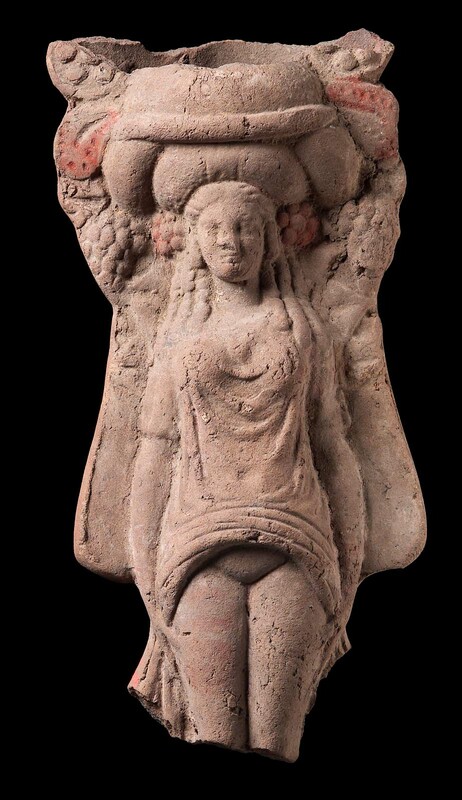 This figure and others of its type were found in a terracotta workshop on the eastern side of Naukratis. High headdress - upper part gone. Rosette and grapes on each side of head. Curls. Body disposed as in 88.918. Broken off through knees. Traces of red coloring in spots, black discoloration on back. From Naukratis. 1886-7: excavated by William Matthew Flinders Petrie for the Egypt Exploration Fund, assigned to the EEF by the Egyptian government; December 22, 1887, presented to the MFA by the EEF. (Accession date: 1888).